Indentification of this design as number 104 is original to Rakusan who designated this woodblock print as the 104th design published in his main sequence. However, 104 is actually the fourth of thirty-six woodblock prints in Rakusan's second main sequence series, 篁子生画選, Koushisei Gasen, lit. 'Koushisei's Print Selection' (usually called here the 36 Series). The woodblock print of 104 was adapted from an actual-size original painting on silk created in early to mid 1933. All of the original prototype paintings for this series are currently in a single private collection. 104 is one of a very few 36 Series designs which were printed in two editions distinguished by different signature and seal combinations. Almost all copies of 104 are from edition I which extended from 1934 to perhaps 1941. The copy illustrated above is typical of edition I (except that it has a later-added city-name stamp in the lower left corner). The scarcity of edition II copies of 104 suggests that only a single print run was ever made. Unfortunately, the time of transition from edition I to later edition II markings is uncertain, but sometime during the post- World War II period from 1948 to 1955 is likely. The earliest 36 Series prints were delivered tipped into recessed wells of presentation sheets embossed in their lower margins with the series title. Because all early edition I prints once had these presentation sheets, a copy which retains its presentation sheet must have been printed during the 1930s. After his supply of presentation sheets was exhausted, Rakusan distributed subsequently-reprinted copies loose. A limited number of leftover earlier-printed copies of some designs on presentation sheets were still being distributed shortly after World War II, but by then most designs were only available as loose sheets. However, absence of presentation sheets is not diagnostic of later printings because many early prints have subsequently been detached from those sheets. Edition I: Museum of FIne Arts, Boston, MA, USA; (50.3782) [not illustrated online]. Edition I: Carnegie Museum of Art, Pittsburgh, PA, USA; (1989) 89.28.1143 [not illustrated online]. The Rakusan project which produced 篁子生画選, Koushisei Gasen, resulted in two related series of woodblock prints. Each print of the 36 Series is intimately connected to a group of prints with the same subjects in the Fan Series. Together these subject-related prints in the two series constitute a theme. Each theme normally consists of a quintet of monochrome Fan Series designs (one design in each of the five fan shapes), plus one polychrome, 36 Series design which illustrates the theme subject. The theme is labeled here by the original Rakusan number of its 36 Series design followed by the subject. 104 is the 36 Series design of the 104 Lily theme. The 104 Lily theme is one of the many entirely regular themes represented by a complete fan quintet and a color woodblock print. The 36 Series design 104 and all five Fan Series designs have seal A which indicates carving dates around the third quarter of 1933. It was during this period that Rakusan was making his initial plans for the two series. He created and carved all of the designs in the first six themes (including those of the 104 Lily theme) plus a scattering of other designs in the months before publication of the series was to begin. Publication of the Fan Series and the 36 Series began in January 1934 with installment one containing the first three themes (101, 102, 103). The Fan Series delivery documents for installment one announce that lily designs would be published the following month, February 1934, in installment two (of twelve). The prints in both series were printed in the same month they were published. Between installment one in January 1934 and installment four in June 1934, Rakusan skipped two monthly deliveries while he sorted out the remaining themes in both series. Because the delivery documents for installment two remain to be discovered, it remains theoretically possible that installment two (containing themes 104, 105, 106) could have been published in February, March, or April 1934. However, the wooden blocks for printing the designs in installment two had already been carved, and there seems no reason why installment two would not have appeared as advertised in February 1934. Other evidence suggests that the two-month break was a single block between installment two and installment three during which major changes occurred in markings and organization. On the delivery documents Rakusan used the theme title 百合, yuri, 'lily', which was also the original title of the 36 Series design 104. Rakusan included at least two different kinds of lily among the 104 Lily theme designs, and the defining subject is just 'lily' rather than any particular species. At least some of the lily designs in this theme were adapted from sketches originally created in the late 1920s during the planning of design 69 in the earlier 100 Series (see below). Bamboo Lily, Lilium japonicum, 笹百合, ささゆり, ササユリ, sasa-yuri, lit. 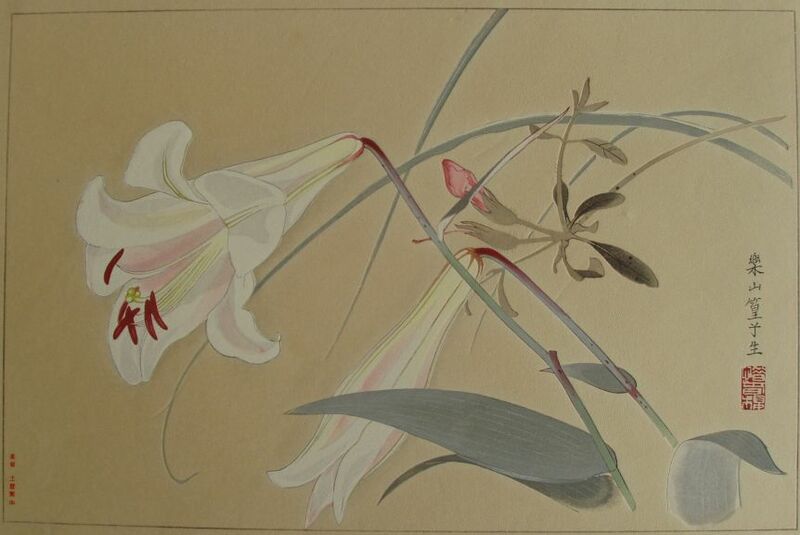 'dwarf-bamboo lily', is the native species illustrated in 104 (and also in 104-1, 104-3, 104-5, and 69).